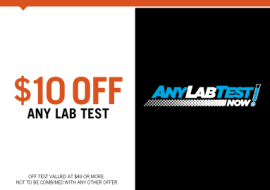 ANY LAB TEST NOW® provides you peace of mind knowing that your tests are completely confidential. Once your results are ready, you choose how you want to receive them. We can mail or fax them to you. You can come pick them up or access them online. No questions asked. Above all, we’ll take every step along the way to ensure your privacy is maintained. They’re your results. Only you should see them.